Come April, and you can already smell the intoxicating sweetness of the mangoes and jackfruits. Rains are at least a couple of months away, and so is school. 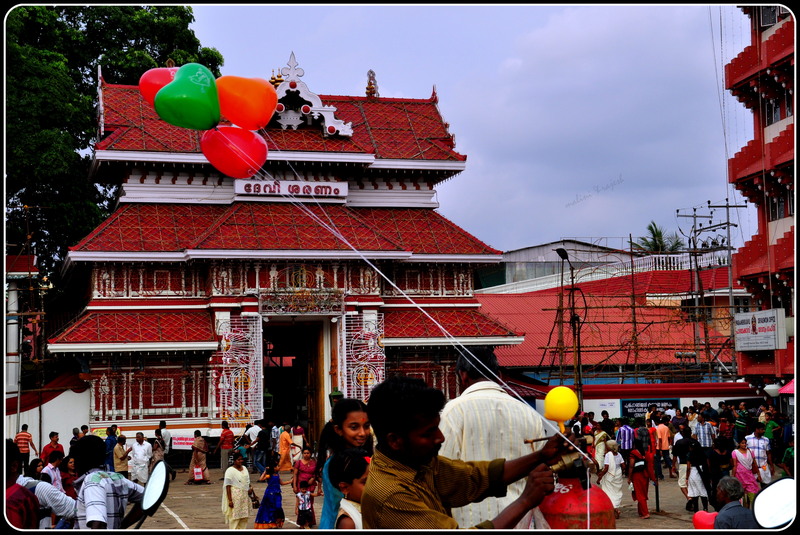 It is also the temple festival season in Kerala, when most of the temples, ranging from the small village dieties to the larger ‘devaswom’ (temple management) run ones, get busy celebrating their annual festivals in their own way. 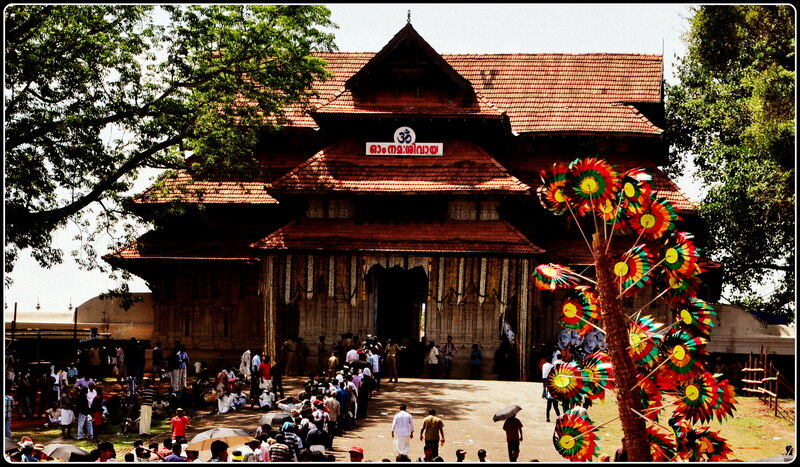 Thrissur Pooram, the mother of all festivals, can eclipse the pomp and pageantry of all these festivities put together. 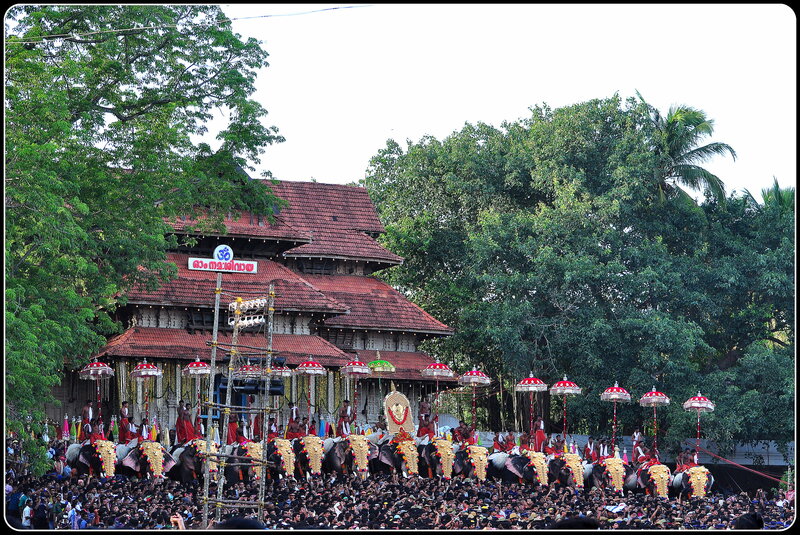 Scores of tourists from India and abroad are drawn in every year by this audio-visual spectacle of the Thrissur Pooram festival. The elephants get busy too, ferried from one temple to another. Have you ever seen an elephant, all decked up, with the golden ‘nettipattam’ (caparison)? 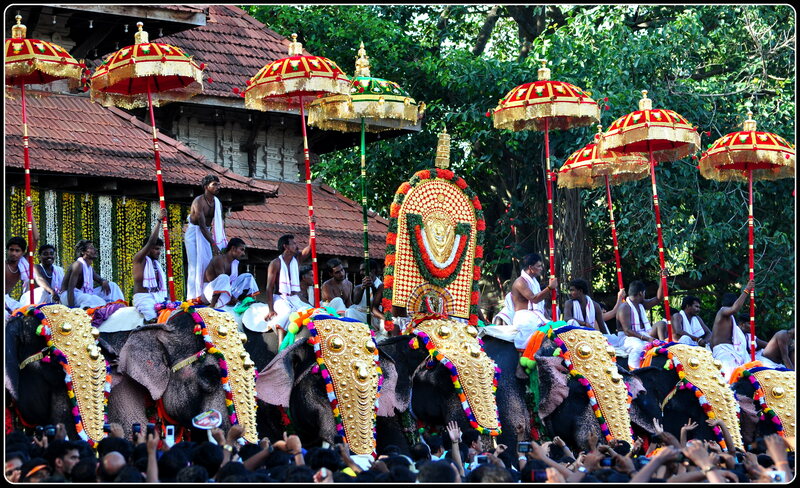 Just imagine how a row of 15 elephants would look, each with three men atop waving the ‘aalavattom’ (peacock-feather fan), ‘venchamaram (white gazelle-hair fan) and ‘kuda’ (silver-sequinned parasols in all the imaginable hues). The elephant in the middle carries the golden ‘thidambu’ representing the deity. The main festivities go on for 36 hours, just as it did 200 years ago when the Cochin Maharajah, Sree Sakthan Thampuran, first organized the festival. 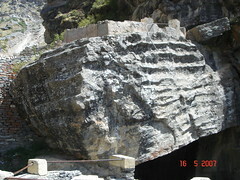 Ten temples take part in the festival. 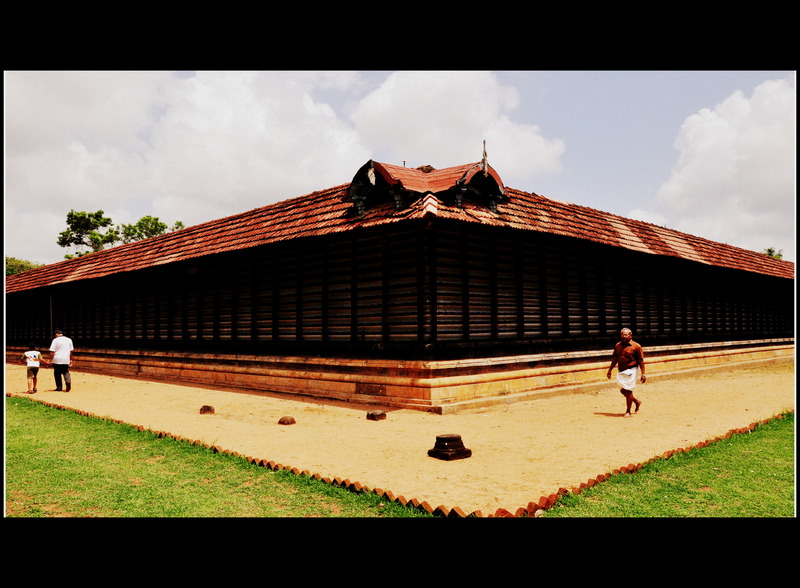 But the principal participants are the ‘Bhagawathys’ (deities) from the Thiruvambadi and the Paramekkavu temples. 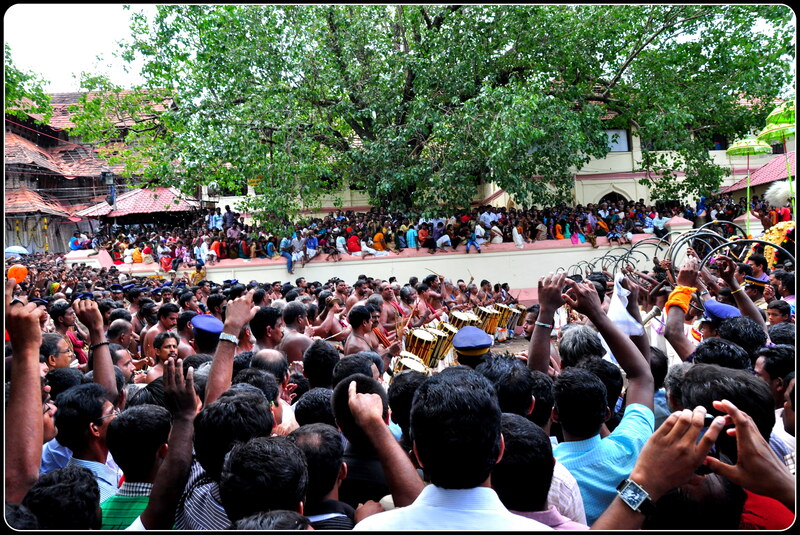 These deities arrive at the Thekkinkadu ground in front of the Vadakkunnathan Temple, each accompanied by 15 gold caparisoned elephants to take blessings from the presiding deity, Lord Shiva. 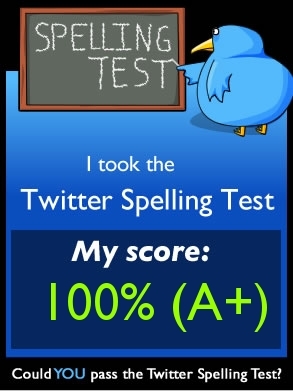 And what is a fair without some competition? 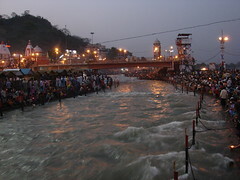 The entourages of the visiting deities divide themselves into two groups, the Paramekkavu group and Thiruvambadi group. 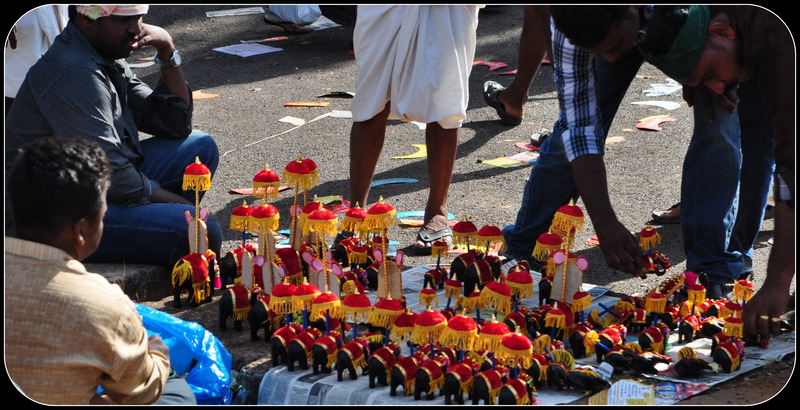 The elephants and musicians representing the two temples face each other in front of the Vadakkumnathan Temple for the most spectacular change of colours, the ‘kudamattam’. 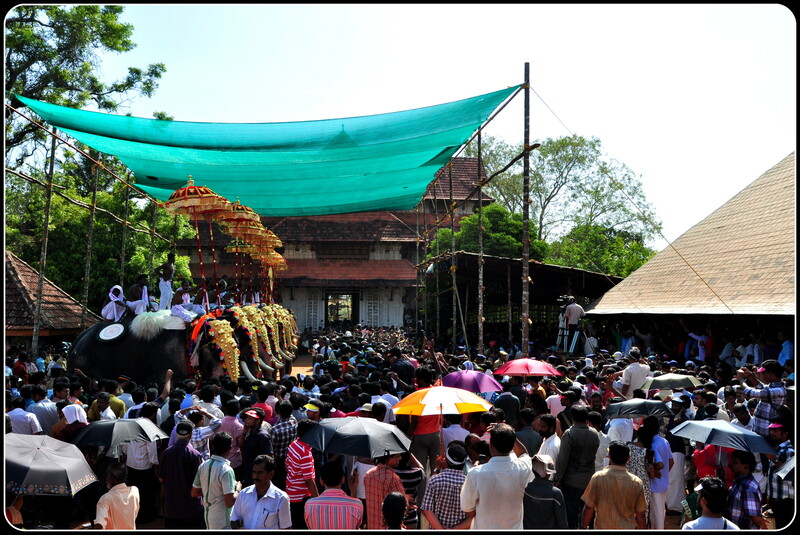 While the traditional ‘melam’, an orchestra of percussion and wind instruments using the drums, cymbals, horn, pipe, led by a 300 member group, represented by each temple, reaches a crescendo, the mahouts change the brilliantly decorated parasols in quick succession. Each change is accompanied by the thunderous applause of thousands of supporters who gather between the lines of elephants, on the surrounding buildings and tree tops. The healthy competition between the two temples also covers the height of the elephants, variety of the caparisons, symphony of the orchestra, and finally the sound and colours of the fire works. Just as visually appealing as the caparisoned elephants and equalling the delightful aural onslaught of the music ensemble is yet another mainstay of the Thrissur Pooram. 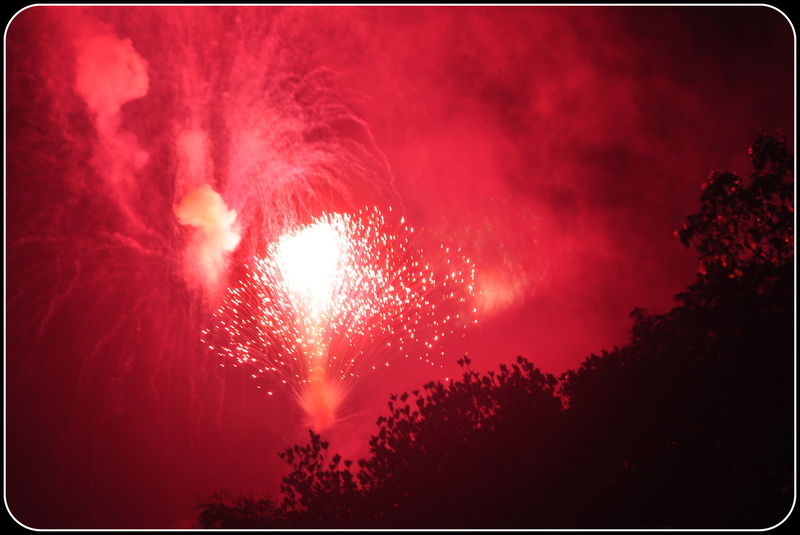 The fiery, benumbing fireworks or the ‘vedikkettu’, if you will. You could choose to catch this magnificent display on the eveing before in the form of the sample vedikkettu or in the wee hours of the morning after – or, better still and as done by most everyone else, on both occasions. 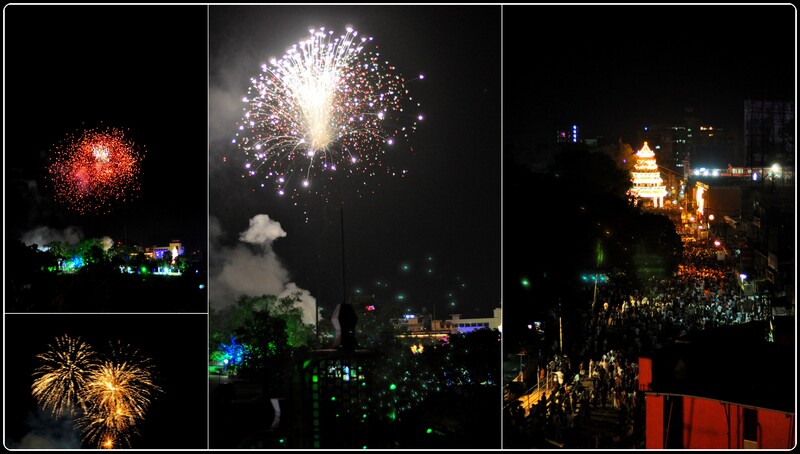 We were lucky to catch the spectacle from the terrace of one of the taller buildings in the round. 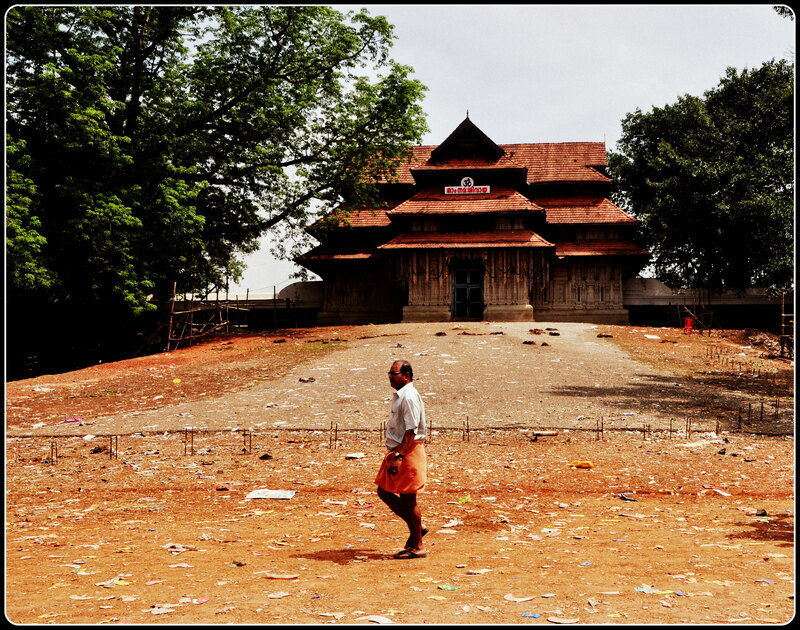 The next day, both the temples arrange processions from the Vadakkunnathan Temple to their respective temples. 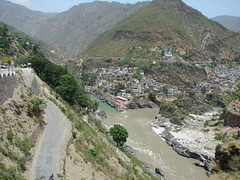 But before that is the ‘Upacharam Cholli Piriyal’, where the Bhagawathys pay respects to each other, bid farewell and promise to meet the next year. 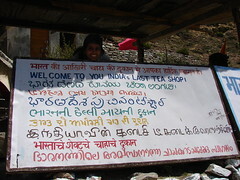 It is not just the Bhagawathys who will return next year. 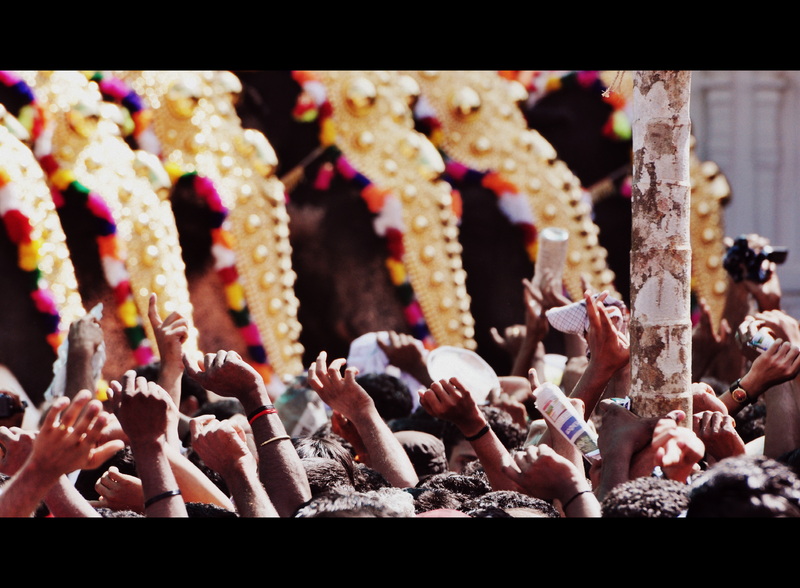 The hundreds and thousands of devotees and Pooram enthusiasts…and us.